Nicole Cooke has taken a spectacular victory in the World Championships. 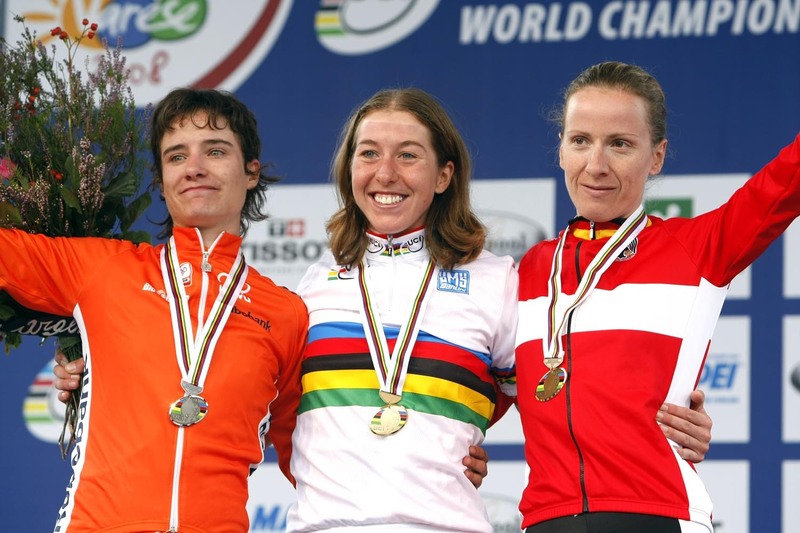 Part of a break of five, the Briton outsprinted Marianne Vos of Holland for gold after a hotly disputed finale. Germany’s Judith Arndt’s was third. 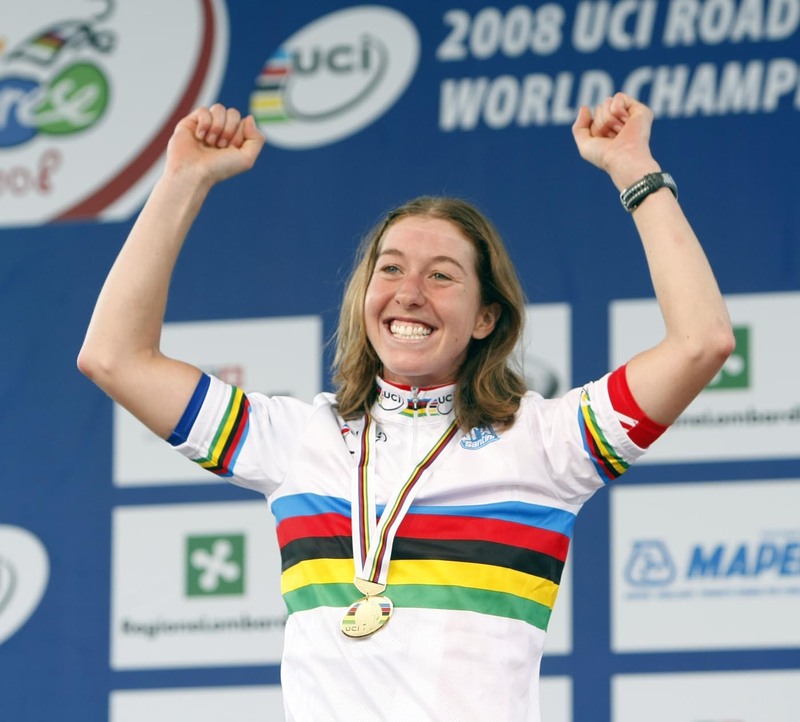 Cooke?s triumph comes just six weeks after winning the Olympic road-race, making the first woman in the history of cycling to take both titles in the same year. It is also Britain’s first triumph in the road-race event – for either men or women – since Mandy Jones in Goodwood back in 1982. Although Cooke’s place in the history books of the sport is now set in stone, in many ways this was a collective victory: Great Britain fielded their strongest ever team for the women’s road-race in a World Championships. But it was Cooke who was the strongest rider in the race, playing a crafty waiting game until the final lap, and the race came together again. After long early break containing Great Britain’s Lizzie Armitstead was caught in the final lap, when – in a very similiar scenario to Beijing – a five rider move went clear containing Germany?s Trixi Worrack and Judith Arndt, Vos, Cooke and Sweden?s Emma Johansson. Cooke sat in, waiting for her chance and keeping her cool, with the Germans making the most of their superiority in the lead group to try and break the move apart. Worrack and Vos made one dangerous bid for freedom, which Cooke brought back, and then the Dutchwoman made an even bigger lone challenge on the main climb. For a moment it briefly looked as if Vos?s move was the right one, but instead the Germans brought it all back together again. With the line fast approaching and the tension mounting by the second, the attacks came thick and fast. Cooke made one big dig, Worrack and then Johansson blasted off again, and the Swedish woman went into the final chicane in the lead. However, even that move failed to work out – after such a fast finish it was clear all five were tiring – and suddenly the pressure eased slightly. Then Vos made one last desperate charge for the line, but Cooke was on her back wheel like a shot. Close to the finish, the Welshwoman charged past for a victory that rounds off a truly remarkable year for her – and British cycling.